Bryant could’ve been a first-round pick in the 2016 NBA Draft. But he decided to spend at least one more year at Indiana. And, I think, he’ll benefit from it. Anunoby was a lightly regarded recruit coming out of high school, relatively speaking. But most expect the 6-8 wing, who is still only 18 years old, to make a huge leap next season and find himself somewhere high on some franchise’s boards. 4. 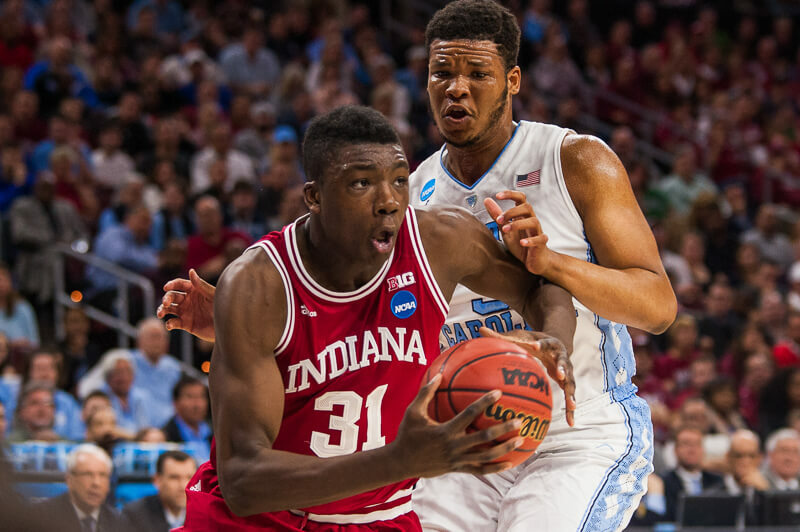 Thomas Bryant, Sophomore, C, Indiana – Only played 22.6 mpg and still put up 11.9 ppg and 5.8 rpg. Not a great rebounder, but there’s a lot to like offensively. Saved his best for Kentucky in March: 19 points. Only a small handful of talented players decided to skip the 2016 draft and return to college. 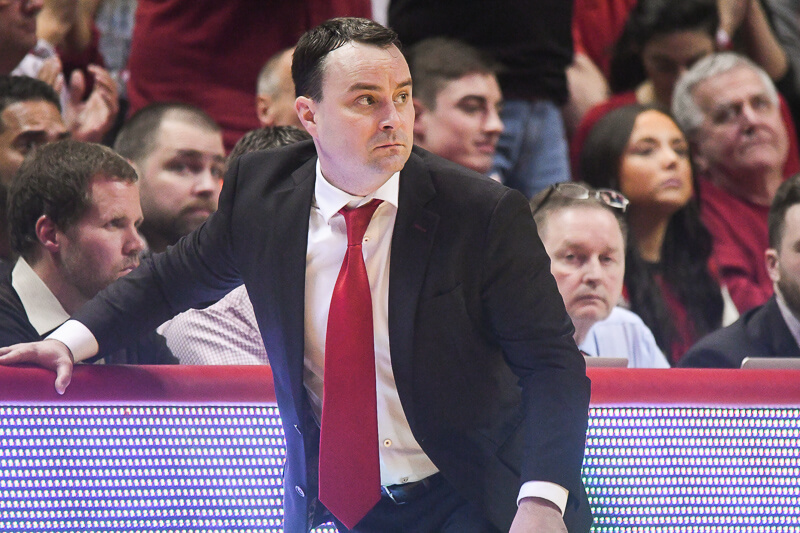 Just about everyone with a shot at the first round threw their hat into the ring, thanks in part to the strength of the incoming freshman class. Only one returning college player — Cal’s Ivan Rabb — will be in the first edition of our top 15 for next year. However, there are a number of interesting returning players — including Syracuse’s Tyler Lydon, Indiana’s Thomas Bryant and OG Anunoby, Kansas’ Carlton Bragg, Duke’s Grayson Allen, USC’s Bennie Boatwright, San Diego State’s Malik Pope and SMU’s Shake Milton — who could all end up in the middle of the first round or possibly higher with excellent seasons. Bryant is raw, so he probably made the right decision to return to Indiana for his sophomore season. Tremendous motor who outworked Diamond Stone in the lone matchup between Indiana and Maryland this season. 6. Thomas Bryant, C, Indiana: Bryant had a good freshman season with Indiana, one where he consistently improved throughout the year. But that was inevitable considering just how bad he was when he got onto campus, especially defensively. He’s 6-foot-11 with a 7-foot-6 wingspan and he plays the game hard and emotionally. Seeing just how much the rest of his game develops — defending pick and rolls, low post offensive, shooting stroke — will determine if he’s a first rounder or a lottery pick. 7. O.G. Anunoby, SF, Indiana: He has elite physical tools. He already is a terrific defensive player; ask Jamal Murray. He’s been compared to Victor Oladipo, although he’s about four inches taller than Victor. If he can make the same kind of jump offensively that Oladipo made, the rising sophomore could be a lottery pick. The question with Bryant simply comes down to this: Was his 19-point effort against Kentucky in the NCAA Tournament a one game aberration? Or a sign of what’s to come in 2017? If it’s an aberration, well, someone will still take Bryant in the lottery next year, based on his 7’0 frame that already carries 250 lbs. and could easily add more weight without losing any quickness or athleticism. But if it wasn’t an aberration, and instead a sign of what’s to come, look out. Bryant could be a double-double machine next year, and a guy in contention for the first overall pick in 2017. Thomas will have to improve his athleticism to remain a lottery pick, I would think. He’s not a great leaper and he needs to get stronger to avoid getting muscled around in the NBA–especially in his legs. OG is the opposite–he has the body, he just needs to keep showing improved skills. Imagine if we’d gotten Shake Milton. Enjoy the opposition clearing out for Bryant’s two handed thunderous dunks in the lane this year. We don’t get this opportunity too often in Bloomington. I hope all the opposition next season similarly disregards JBJ, as the genius observers of the NBA are doing. He’s going to average 18 points. Don’t worry about it, nothing to see here. He might put up 18 per game, but he will give up 25+. No lateral quickness whatsoever. I see no reason for us to not have dunk after dunk after dunk… I’ve always wondered why we don’t have PG’s who throw more oops… wonder if Newkirk will… throwing the oop on a drive to the basket has become one of the most deadly plays in basketball. As for Bryant… he needs to work on defense. He doesn’t have much foot speed on defense. That hurts him a lot in the pick and roll. I can easily see him being a lottery pick. None of those guys have the chance except for JBJ. He could be a Top 20 pick if he’d just play some defense. Sarge, you know they are. We have the good fortune to have a bunch of kids at IU that are ‘highly motivated’ and they will work their a$$e$ off to be successful. You can bet on the hours they are spending at Cook Hall. this summer. gosh, I just can’t wait until basketball season opens this fall. I really think we’re in for a treat. There were a lot of guys chosen as lottery this year that aren’t anymore athletic than Thomas is right now.. So you’re thinking 6′ 11″ with a 7′ 6″ wingspan, who runs the floor like a gazelle, doesn’t have the ‘athleticism’? Pardon me???? All he needs is the defensive positioning, moves on offense, etc… athleticism, mashsleticism, come on man??? He’s going to be GREAT. Blow itoutcherbutt.. He has as much lateral quickness at NZ, who by the way was a relatively decent defender by year’s end. I ain’t sayin e’s going to be a great defender, but give the guy a chance b4 you relegate him to defensive mediocrity.. wood ya? I agree ‘Baby Cakes’.. TB has enough foot spped to remain a lottery pick EASILY… He will be I assure you. And it is just not that difficult to throw it up for someone to catch and dunk. These guys can get up. I’ve always wondered why we dont run more of that as a set play. I just think we are going to be a match up nightmare. TB is going to be all-American with a solid post game. We are going to be able to spread and hit threes. Our rebounding should be stellar. Guys will be locked in on D. Excited for this year. But we could have James Blackmon AND Shake Milton. Lol, just saying. What if DeRon Davis is so good, we have to start him? Could O.G. be the 3 man, with a Blackmon and Newkirk backcourt? With RJ, Jones, Hartman and Morgan rounding out the rotation, we have the best bench and the best starters in the league. Great point. I think this years offense will be mostly a tall lineup with just one point guard. One moment I will never forget is CTC consoling Thomas Bryant in the locker room after the North Carolina game. TB is special. JBJ may be the point guard this year. Maybe. Hell, I really don’t know. I really think it should be. Typically you would lose offense going big, but CH and OG can hit threes from the small forward position, which is an incredible advantage. Our defense is going to be so long, and really tough to score on. Blackmon will be much improved on D this year…mark it down. Our team is looking a lot like North Carolina’s from last season. We need CuJo and Deron to be good right away. Gotta love Crean’s recruiting. In Vonleh’s year we couldnt shoot, so he got shooters. The next season we had no bigs, so he went and got a cupboard full of em. This season, we’re big, we can shoot, and we have depth. No single player has more on their shoulders for us to be good, than Newkirk. If that kid is great, we will win the B1G again. Considering OG is a SF… I think he can play the 3. Agreed, that was an awesome picture. And then TB announcing that he’s staying soon after, sending a signal to his teammates and everyone else that he intends to do something special next year. Can’t forget about the bond he clearly has with CTC, which I think will extend to the rest of the team as well. I really do think next season is going to be a lot of fun. Only one minor disagreement: I don’t think JN has to be “great” for us to win the B1G again. I think he just needs to be solid. His defense was already picking up before he was hurt last season (and after he was spending more time on the pine). Watching the Duke game, JBJ was not the biggest problem on defense. In fact, Yogi’s defense was often worse. Once the team turned it around on defense, everyone (including NZ) improved, and I’m certain JBJ would have been there with everyone else. He may never be a great defender, but he won’t be a liability, and his shooting will be essential in spreading the floor. Yep. And, TB’s defense improved significantly by year’s end. He takes that next leap, he’s going to become a real monster defensively in the post. And I can’t wait to see it. Hey, I think some stores are already putting out their Halloween displays. Haha, I think you missed the point….of course he can play the 3. For the last 2 seasons though, weve played with either 1 or 0 true bigs on the floor at a time. Last season OG played the 4 a lot with TW or CH at the 3.This will be the first season where we could legitimately have 2 bigs in Davis and Bryant on the floor at the same time, allowing OG to slide to his more natural spot. 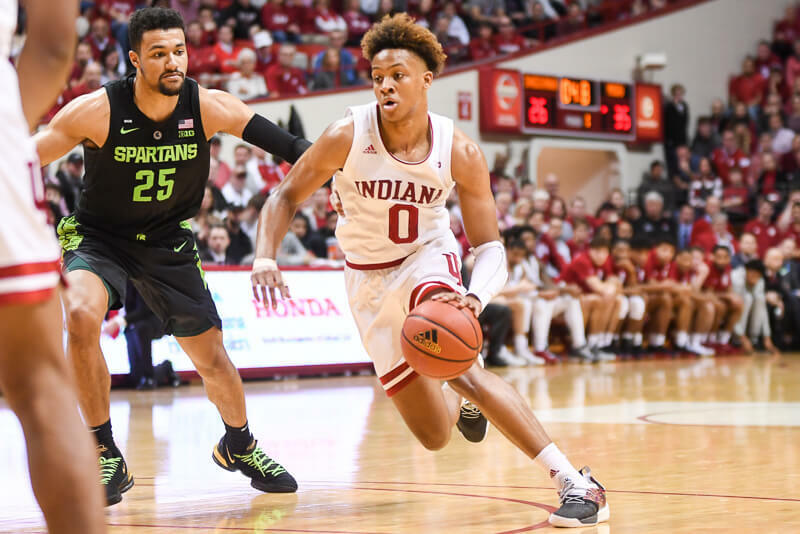 Most posters on here have said they dont think Crean will start both TB and DD, so Im more suggesting the “what if he did” side..
Then OG would play the 3 unless he’s terrible. How deadly will JW be with that jumper and a good shoulder?! He can handle decently too for his size. same here, was as genuine a moment as you’ll ever see on television. Who is JW? If you are meaning JM, then I agree. He is going to be great. An under-the-radar guy IMO. I’d also counter that a lot of those guys of whom you speak that got drafted are European players with less tape to review. The American players get torn down by the scouts because there’s more to evaluate–I don’t necessarily think it’s right, but how many times do you see some guy with five-syllable last name get taken and never play a minute in the league? I hope he’s about the 4th or 5th option to run the point for multiple reasons. 1.) He is reluctant to pass. 2.) He’s a guy you want getting open off screens because he doesn’t get open on his own. 3.) He’s not that great of a ball-handler. I think Blackmon has the physical ability to play defense, he just doesn’t have the determination. He isn’t the quickest but he’s quick enough (Hartman guards people and he’s not that quick.) Blackmon uses his hands too much and feet too infrequently on defense–quit going for a damn steal every time and just stay in front of the guy! Agree. There’s absolutely no reason to have JBJ running the point. He’s also a great shooter who will be the leading scorer. Let defenses worry about stopping the ball in others’ hands while also running around trying to stop JBJ without the ball. And then there’s all the other guys, too, most of whom can shoot the 3. 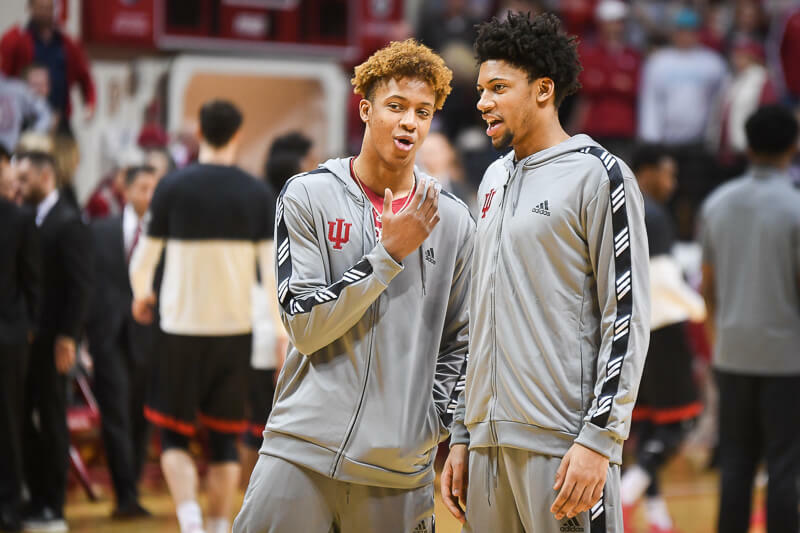 You could almost argue that IU won’t even have a point guard next season. Jeez, if Morgan is competing for a 9th or 10th spot….wow. Frankly, I see him as being a key piece by the end of the season, something approaching Max’s contribution last season. Another Bryan Evans-type but with a bigger post presence. So many weapons. Assuming he stays healthy, Morgan might very well be a team captain his junior season, a real start. I’d put him above McSwain and most others for the next season. Morgan probably starts over DD, at least for non-conference. With his hair, he’s at least as tall as DD. After I posted that I realized it was way off. I do think that Newkirk will be point and 4 bigums will be the rest of the lineup. You are right. I realized that after I posted. And use his left hand for something more than an occasional dribble or as part of a crossover move. 4) A good, or even decent PG, has to utilize their left hand way more than he has in the past. Boom ! See nail, see hammer squarely hit nail !